What is cornmeal? 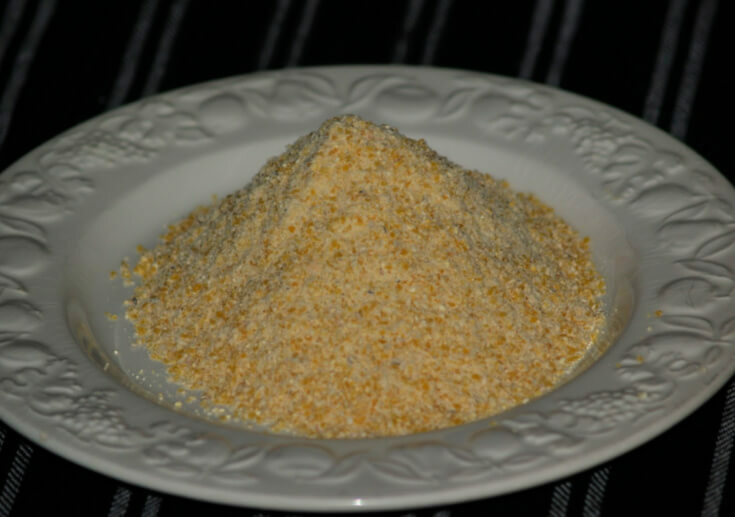 As it sounds, cornmeal is a meal or coarse flour made from corn. It is a staple in my kitchen as well as in many in this country and in most other parts of the world. Cornmeal can be purchased in three colors; white, yellow and blue, all made from the coordinating color of corn. The blue cornmeal has a slightly sweeter flavor then yellow and white. I never use the blue but I have tasted corn chips made with blue cornmeal. I use a lot of the white cornmeal and yellow cornmeal. This is not determined by any specific type of recipes but more by what taste and texture I have in mind. Both white and yellow cornmeal is good for cornbread, muffins, hush puppies and breading of fish. Sometimes I decide by what “color” I want to achieve in the recipe. What is cornmeal used in? More important than color to me is the type of grinding resulting in different textures. Finely ground cornmeal is great for cakes, cookies and pancakes. Finely and medium grinds can be used in most recipes. In some of my recipes like certain breads, I love the great texture I get from the coarsely ground cornmeal. I also use the coarsely ground under pizza crust when baking. You will also see some packages labeled “stone ground”. As it sounds, this is corn which has been slowly ground between two stone wheels. Although similar to coarse ground cornmeal, it is coarser and considered to be healthier. In commercially ground cornmeal most of the hull and germ is removed and is stone ground more is left. Of all different types of cornmeal available, yellow stone ground is my favorite. Many recipes will recommend a certain type for the recipe. Self rising cornmeal is also available but you can add your own leavening if you do not have it. Simply MIX 1 ½ Teaspoons of baking powder and ½ teaspoon salt with each 1 cup of cornmeal. Some recipes even make things a little easier by using the “mixes”. Do not be afraid to try different types in your recipes than what it specifies. They all produce good results; it is a matter of what you prefer. 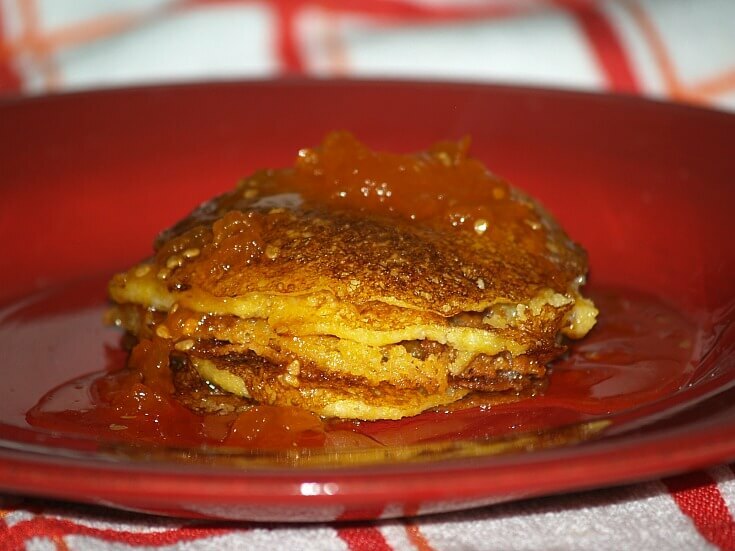 What is cornmeal in pancakes? Combine cornmeal and salt; slowly stir in boiling water and butter. Stir the buttermilk and egg into the cornmeal. Combine the flour and soda; quickly stir into the batter. 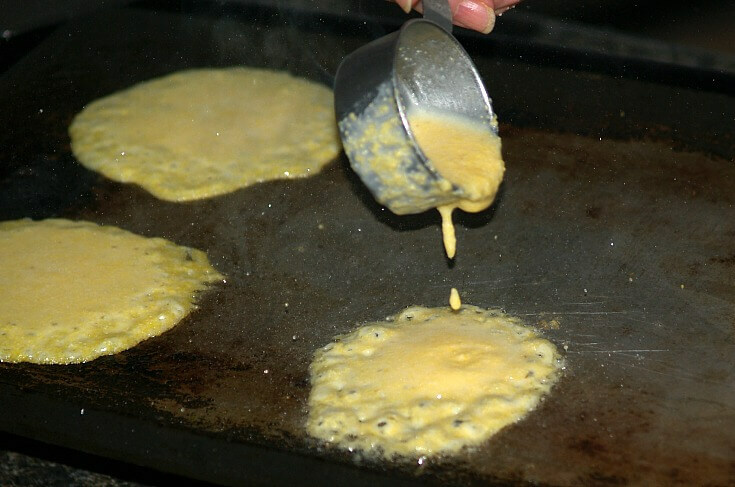 Cook on a well greased hot griddle using 3 Tablespoons of batter for each. When each pancake is brown underneath turn it over and cook to brown other side. Turn only one time; serve with preserves, marmalade or syrup. What is cornmeal when making crackers? Preheat oven to 425F degrees; butter 1-2 baking sheets. Add the boiling water gradually to the cornmeal. Add melted butter and ½ TEASPOON salt; mix until blended. Spoon a scant teaspoon of batter onto prepared baking sheets. Spread batter into 2 inch circles; sprinkle tops with salt. 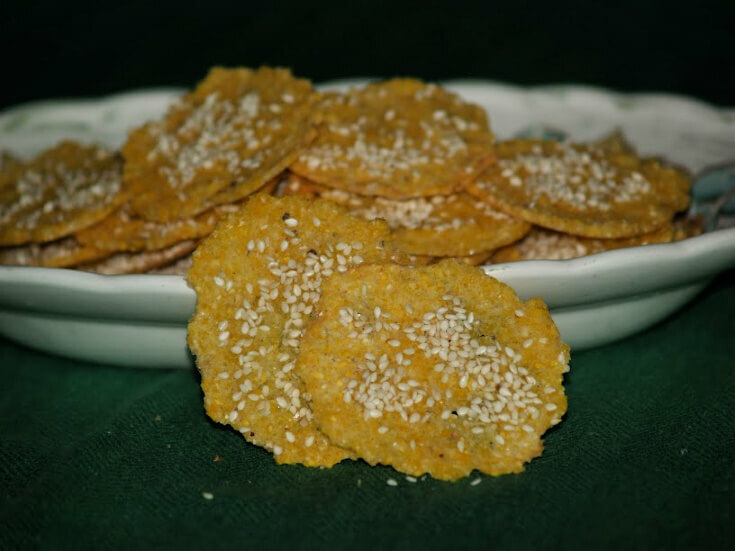 Place a little sesame seeds on top of each cracker. Bake 8 to 12 minutes until edges begin to brown and centers are firm. NOTE: If crackers are not crisp when cooled return to oven briefly. What is cornmeal in Mexican cornbread? Combine all ingredients and mix well; pour into a greased casserole dish. Bake about 25 minutes or until a pick comes out clean; serves 8. What is cornmeal in cookies? Preheat oven to 375F degrees; butter and flour cookie sheets. Sift together cornmeal, flour, ammonium bicarbonate and salt; set aside. Beat the egg yolks; gradually beat in the superfine sugar. Beat in the lemon peel and butter until thoroughly blended. Gradually beat in the cornmeal mixture until smooth; stir in currants. NOTE: Batter should be firm but not stiff. Cornmeal varies making the difference in the moistness. You can add 1 to 2 teaspoons water if necessary to soften dough. Drop dough by heaping tablespoonfuls onto prepared cookie sheets 2 inches apart. Pat cookies into diamond shapes; bake about 15 minutes until crisp. Cool on sheets few minutes; transfer to rack and cool completely. Dust with powdered sugar; makes about 40. *NOTE: Although I almost never have ammonium bicarbonate in my recipes, it is often used in some German and other European baking. It is called “bakers ammonia” and is sometimes used as leavening in cookies and flat breads but never in cakes. The best substitution is double acting baking powder, baking soda or a mixture of both but the results are not the same. Bakers claim cookies are crisper and shaped cookies hold the shapes better. I have never seen this product for sale. The best place to purchase it is online. What is cornmeal when baking nut cakes? Preheat oven to 350F degrees; grease and flour 9X13 inch cake pan. Combine and mix together all ingredients; pour into prepared pan. Bake for 30 to 35 minutes until pick comes out clean. OPTION: Dust with sifted powdered sugar. What is cornmeal when baking Madeleine cookies? Preheat oven to 350F degrees; liberally brush Madeleine molds with melted butter. In medium bowl combine flour, cornmeal, sugar, lemon peel, cream of tartar, soda and salt. In another bowl beat together the egg, cream and vanilla; add 2 TABLESPOONS of the butter. Add the cream mixture to the dry ingredients mixing just to blend. Spoon batter into prepared molds filling halfway; bake 10 to 12 minutes. NOTE: Cakes will spring back when pressed lightly. Cool slightly; loosen with table knife and cool on rack. What is cornmeal when baking cakes? Preheat oven to 350F degrees; grease and flour 9 inch cake pan. Add melted butter to pan and tilt to spread; set aside. In large bowl stir together muffin mix and next 5 ingredients until well mixed. Spoon half of the batter into pan; scatter ½ CUP of the grapes over the batter. Spoon in the remaining batter; top with the remaining 1 CUP of grapes. Sprinkle the turbinado sugar over the top. Bake 25 to 30 minutes until pick comes out clean. Cool 5 minutes in pan; run knife around edges to loosen. Pour buttermilk orange glaze over warm cake. In small bowl stir together the buttermilk, orange peel and orange juice. Add powdered sugar; mix until smooth and pour over warm cake. What is cornmeal in spoon bread? Preheat oven to 375F degrees; grease 9 inch square baking pan. Combine and mix eggs and next 6 ingredients in medium bowl. Spread mixture in prepared pan; bake 50 to 60 minutes until set. Top servings with shredded Cheddar cheese, salsa and sour cream if desired. What is cornmeal in rolls? Combine and mix cornmeal, sugar and salt in top of double boiler. Add the milk gradually stirring until smooth; add shortening. Cook mixture over hot water (NOT boiling) until thick stirring constantly. Cover and cook for 25 minutes; cool to lukewarm (About 112F to 115F degrees). Dissolve the yeast in warm water; add to the cornmeal mixture. Stir in enough flour to make a soft dough; place in a greased bowl. Cover bowl and let rise until doubled in bulk. PREHEAT OVEN TO 425F degrees; grease muffin pans. Turn out onto lightly floured surface; shape into rolls and place in pan. Cover and let rise in warm place until doubled. Bake 15 minutes until golden; makes about 38 to 42. What is cornmeal in sausage pie? Combine sausage, peppers and onion in a large skillet. Cook until sausage is no longer pink; drain fat. Add beans, tomatoes, tomato paste, wine, sugar and cilantro. Bring mixture to a boil; REDUCE heat to low and keep warm. Combine and mix in large bowl the flour and corn meal. Stir in the Parmesan, baking powder, garlic, parsley and chives. Add the egg, milk and oil; stir just until dry ingredients are moistened. Drop batter by spoonfuls on top of the sausage mixture. Bake 12 to 15 minutes until golden brown; serves 6. What is cornmeal in stuffing? Combine cornbread, salt, pepper, basil, chervil, sage and oregano. Spread over a baking sheet; toast mixture in a warm oven. NOTE: Do not brown but only dry out. Place crumb mixture in a large bowl; add onion, parsley, butter, eggs and cheeses. Cover mixture and chill; use as a stuffing or place in greased baking dish. Bake at 425F degrees until firm to touch (About 35 to 40 minutes). Preheat oven to 350F degrees; grease 9 inch round cake pan. Sift together the cornmeal, flour, salt, sugar, baking powder and spices. In another bowl whisk together the eggs, applesauce and juice. Fold the dry ingredients into the egg mixture just until blended. Pour batter into prepared pan; bake 25 to 30 minutes until pick comes out clean. Cool 10 minutes in the pan; turn out onto a cake plate and cool. Serve with warm sauce; serves 8. Combine butter, milk and brown sugar in saucepan over medium heat. Stir until completely melted and combined; remove from heat and stir in brandy. Serve with servings of cake.